When Alicia McClelland learned that her friend Kimberly had been diagnosed with stage IV breast cancer, she made the decision to tie her upcoming marathon into a fundraiser that could help Kimberly with her medical expenses. By turning to DonationTo, Alicia was able to quickly and easily launch a medical fundraiser that enabled her donors to make a contribution 24/7 from any web enabled device. Unlike most online crowdfunding sites that claim to be free, Alicia was actually able to keep 100 percent of the donations she raised. The reality is that so-called free fundraising platforms typically keep 5 percent of each donation, and this really adds up over time. 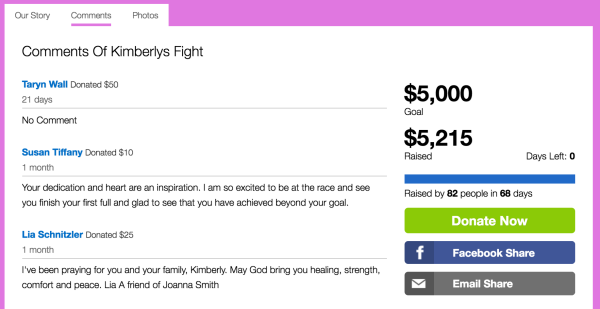 For example, the fundraiser for Kimberly’s Fight collected $5,215. If 5 percent had been taken off of the top, this would have caused $260.75 to go toward fees instead of Kimberly’s medical bills. Fortunately, DonationTo’s paid fundraising accounts make it possible to raise an unlimited amount of money for as little as $9 per month. As an added bonus, we include extra features that help increase contributions, including unlimited photo uploads and online payment processing via PayPal and WePay. Fundraisers can also receive assistance with their campaign via phone support. Kimberly is a nurse, educator and mother who is known to be caring and selfless. When she received a stage IV breast cancer diagnosis, her friend Alicia knew that it was necessary to offer emotional and financial support. Sadly, the typical insurance plan in the U.S. is not good enough to fully cover the costs associated with cancer treatment, and even the best plan can leave people battling with bankruptcy. Therefore, many people turn to DonationTo as a resource for collecting the necessary funding to avoid a financial hardship. Alicia was already in the midst of training for her first full marathon when Kimberly was diagnosed, so it made perfect sense to combine these two things into one crowdfunding campaign. Alicia requested that friends, coworkers and family members make a donation in honor of Kimberly’s struggle and to commemorate the marathon. Combining these two goals made it possible to acquire enough support to exceed the original online fundraising goal of $4,000. Approximately 12 percent of women in the U.S. will face breast cancer at some point in their life. More than 307,000 women will get a diagnosis this year, along with 2,600 men. Tragically, 40,450 women are expected to lose their cancer battle this year. Early detection and treatment is one of the most effective ways to survive breast cancer, so it is imperative for women to get regular screenings. The good news is that breast cancer rates have been steadily dropping for 16 years, and there are also 2.8 million women living in the U.S. today who have dealt with this disease. In other words, women like Kimberly can benefit from the many medical advances that have been made, and everyone else’s risk of developing breast cancer becomes slightly lower every year. In time, it is possible that the most common cancer that women face will be completely eradicated. In the meantime, it is vital for women such as Kimberly to have access to treatment, emotional support and fundraising options. At DonationTo, we believe that everyone should have the ability to receive top-notch medical care without accruing a mountain of debt. This is the main reason that we have created an easy to use crowdfunding platform that Alicia and other members can take advantage of without having any special technical skills or previous experience. Our partnership with PayPal and WePay also boosts online donations and provides members with instant access to funding. Money is critical for fighting cancer, but so is emotional support from friends and family. Therefore, we give each donor the opportunity to post a few kind words with their contribution. These comments cannot change anything, nor will they pay for Kimberly’s medical bills. But they will offer some much-needed solace, and studies have proven that emotional support can have a huge impact on a patient’s ability to survive a serious medical issue. 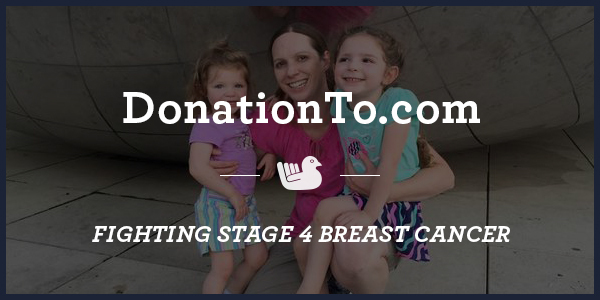 When Alicia found out that Kimberly had stage IV breast cancer, she launched an online fundraiser via DonationTo with the intention of raising $5,000. Alicia tied her efforts into an upcoming marathon, and she was able to gather enough support to exceed her goal. Our affordable paid accounts also made it possible for her to receive 100 percent of each donation, which reduced her crowdfunding fees by more than $250. This is critical because every penny matters when someone is facing huge medical bills. DonationTo also offers numerous options that make it possible to boost donations. For example, users can upload an unlimited amount of photos, and donors can contribute online 24/7 from their laptop, tablet, desktop or smartphone. We offer phone support to help families raise money online, and there are other free tools available such as social media integration. Alicia’s medical fundraising campaign was a complete success, and this removes a lot of the financial burden from Kimberly’s shoulders. Studies have found that emotional support improves a cancer patient’s odds of survival, and the many comments that were left on the Kimberly’s Fight page are certain to help lift her spirits during the treatment process. www.DonationTo.com and we will be your 1st donor !